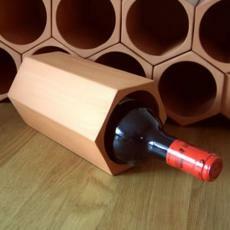 These modular designs, creating a beehive effect, are ideal for any sized wine collection, whether you want a single cell to start off or a large honeycomb design for 50 bottles, or are even perhaps looking to expand further. 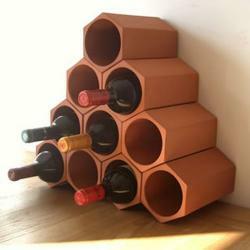 As your collection grows, you simply add more terracotta modules, and your wine rack will grow right along with it. This way, your collection is not limited to the amount of free space you have in your wine rack – simply add more and be on your way! As the cells stack next to and on top of each other, this kind of wine rack is ideal for large spaces and small cupboards alike. Terracotta wine racks are perfect both for commercial and personal use, offering the flexibility to build as big or as small as you require. For free standing terracotta wine racks, we also offer keystones to create stable structures and sleek lines for ultimate practicality and design. Terracotta is not only an attractive, versatile and robust material; it also has natural cooling properties, which means your favourite bottles are kept nicely chilled at all times. 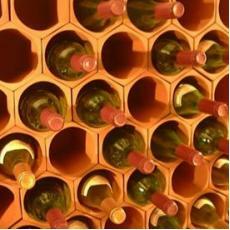 There will be less emphasis on where your wine rack is stored due to the terracotta material used, which will ensure that your bottles are stored in a cool and dry place at all times. Regardless of whether you have the luxury of a basement, choose to hide away your wine rack in the cupboard or make do with the kitchen side, you are guaranteed exquisite tasting wine every time. Not only does the terracotta material make for a unique and distinct design, it is arguably the most practical option on the market. 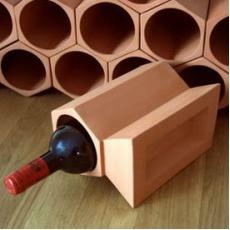 So try something different for your wine storage solution and choose terracotta as your choice of material.